Alan Morton Dershowitz is an American lawyer, jurist, and political commentator. He is the Felix Frankfurter Professor of Law at Harvard Law School. 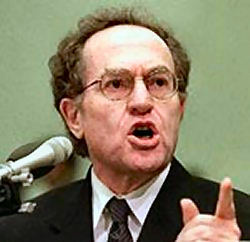 Dershowitz is known for his career as an attorney in several high-profile law cases and as a commentator on the Arab-Israeli conflict. He has spent most of his career at Harvard, where, at the age of 28, he became the youngest full professor of law in its history. As a criminal appellate lawyer, Dershowitz has won thirteen out of the fifteen murder and attempted murder cases he has handled. Notable cases include his successful argument that overturned the conviction of Claus von B�low for the attempted murder of B�low's wife, and his role as the appellate advisor for the defense in the criminal trial of O.J. Simpson.